Arcing along the southeast coast of England, we'll travel from Canterbury (with its famous cathedral) to Dover (stoutly fortified from Roman times to the Battle of Britain). Then we'll hike the trails that top the towering chalk cliffs of the South Downs, wander into the beachy resort of Brighton (England's Coney Island), and push on to Portsmouth, whose naval heritage has left it with the best collection of historic sailing ships anywhere. The famous cliff called Western Heights — opposite Dover Castle, just outside of town — provides a sweeping view of Dover (and occasionally of France). The trail along the cliff weaves around former gun posts that were originally installed during Napoleonic times, but were used most extensively during World War II. Today, the bunkers are abandoned, but in decent condition. Peaceniks find it an excellent picnic spot. For a different (and many say better) view from the cliffs, as well as a fascinating look at one of the world's busiest ports, head east of town to the White Cliffs of Dover Visitor Centre (2.5 miles along a footpath east of town). You'll find exhibits about the cliffs and local flora and fauna, plus a handy café and ample space for picnicking. Strategically located Dover Castle — considered "the key to England" by would-be invaders — perches grandly atop the White Cliffs of Dover. English troops were garrisoned within the castle's medieval walls for almost 900 years, protecting the coast from European invaders. With a medieval Great Tower as its centerpiece and battlements that survey 360 degrees of windswept coast, Dover Castle has undeniable majesty. While the historic parts of the castle are unexceptional, the exhibits in the WWII-era Secret Wartime Tunnels are unique and engaging — particularly the powerful, well-presented tour that tells the story of Operation Dynamo, the harrowing WWII rescue operation that saved the British Army at Dunkirk. For a leisurely, water-level view of Canterbury, consider a sleepy cruise on the River Stour. Three fun-loving companies, run by students, compete. They each offer 40-minute trips up and down the sleepy creek (just a couple of feet deep) and leave almost constantly with demand from 10:00 to 17:00, and sometimes later. All have roughly the same cost, duration, and simple route. I suppose the difference is that the punt trip (where you're propelled by the traditional single pole) is more of a joyride, while the big rowboat tours come with a more serious narration. Enjoy the sales pitches from the students posted on High Street to snare business. Of the three, only Canterbury Punting Company has a proper rental office. One of the most important churches in England, this is the headquarters of the Anglican Church (something like the English Vatican). There's been a church here ever since St. Augustine, the cathedral's first archbishop, broke ground in 597. In the 12th century, the cathedral became world famous because of the murder of its archbishop, Thomas Becket. Canterbury then became a prime destination for religious pilgrims, trumped in importance only by Rome and Santiago de Compostela, Spain. And when Henry VIII broke with the Roman Catholic Church 400 years later, this cathedral became the Anglican version of St. Peter's Basilica. A visit here leaves you impressed by the resilience of this spot — so holy to so many for so long. In 1066, a Norman (French) nobleman — William, Duke of Normandy — was victorious in the Battle of Hastings and seized control of England, leading to a string of Norman kings and forever changing the course of English history. While the battlefield and adjoining ruined abbey (built soon after the battle by William to atone for all the spilled blood) are a must-see for British-history buffs, anyone can appreciate the dramatic story behind the grassy field. Gaze across the unassuming little valley and imagine thousands of invading troops. Your visit can last from three minutes to three hours, depending on your imagination. The pier, opened in 1899 and long known as Palace Pier, has gone in and out of fashion; in recent years, it's come back to life, thanks to an expensive restoration. The main pavilion is a 19th-century gem. Some regard King George IV's palace itself as a work of art, furnished with a mix of English, French, and Chinese pieces and adorned with gilded dragons and carved palm trees. The result is colorful and exuberant…some would say gaudy. Like Brighton itself, the place smacks of faded elegance — but it's fun to tour. It's free to enter the restored Regency gardens surrounding the Pavilion. Marveling at this spot is England's best "white cliff experience" and a highlight of any tour of England's south coast. Located 25 miles east of Brighton, it's an easy visit by car, and a not-to-bad trip by bus in summer (buses run daily mid-June through August, but run only on Sundays in the off-season — when a train/taxi combo via Eastbourne is the next-best option). The South Downs Way (often abbreviated SDW) runs for 100 miles along the chalk hills of England's south coast, from Winchester (25 miles inland in Hampshire) to Eastbourne (on the coast of East Sussex). It's a bridleway, which means you can walk, bike, or ride a horse. (Walkers have priority over horses and bicycles, and while motorized vehicles are not allowed on the SDW itself, much of the path runs along farm tracks, so you may encounter fearsome tractors.) While you can walk along almost the entire southern coast, the best part for a day hike is the three-mile stretch out to Beachy Head from Birling Gap or from Eastbourne. This is the best place in the Beachy Head area for a meal and great for an overnight. It boasts a classic pub interior with fun walls to read, rustic picnic tables on the green, popular burgers and fish-and-chips, and five comfy rooms for rent. Britain's great warships, known as the "Wooden Walls of England," were all that lay between the island nation and invaders from the Continent. Today, Portsmouth's harbor is still the base of the Royal Navy. (If you sneak a peek beyond the guard stations, you can see the British military at work.) The shipyard offers visitors a glimpse of maritime attractions new and old. Marvel at the modern-day warships anchored on the docks, then explore the fantastic collection of historic naval memorabilia and well-preserved ships. Friendly and knowledgeable docents, many who were once seamen, are found throughout the complex, happily answering questions and telling tales of the sea. The Dockyard is a sprawling complex with about 10 different attractions (several are a shuttle-boat ride away). With finite time and energy, I'd have these priorities: Save most of your visit for the HMS Victory, the Mary Rose, and the Museum of the Royal Navy. Visit the HMS Warrior and the HMS M.33 briefly. You can stroll around the Dockyard to see the exteriors of the HMS Victory and HMS Warrior for free, but going inside the attractions requires a pricey ticket. You can save about 10 percent on your admission by buying from the Portsmouth tourism office, booking online, or by getting it with a day-trip train ticket from London (smart to buy at least one day ahead). Hi, I'm Rick Steves, back with more of the best of Europe. This time we're enjoying both historic and natural highlights — just hanging out on the southeast coast of England. Thanks for joining us. Traveling across the south of England, we'll ponder the military underpinnings of a maritime society that hasn't been invaded in a thousand years. At the same time we'll have fun with the Brits at play and connect with their great outdoors. We'll admire Henry II's formidable castle, prowl through Britain's most historic warship, see where the archbishop of Canterbury works, glide on a dreamy stream, holiday on a Victorian pier, marvel at a royal seaside pleasure palace, and hike an unforgettable bluff. 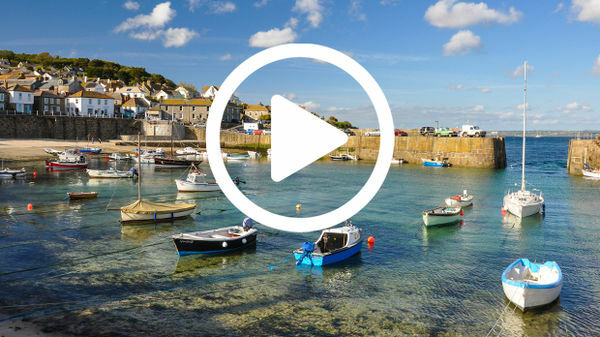 Great Britain is dominated by England, and we'll explore its southeast coast. Starting in Dover, we'll visit Canterbury, the site of the Battle of Hastings, Beachy Head, Brighton, and Portsmouth. The White Cliffs of Dover overlook the English Channel. Ever since ancient Roman times, those crossing from the Continent to Britain set their sights on these famous cliffs. If there were enemies, troops based here fended them off. Today, the crossing between the port of Dover and France is a shipping thoroughfare. Ferries and freighters shuttle passengers and an endless stream of trucks back and forth. France is just 23 miles away. There it is, within sight on a sunny day. Southern England sits upon a foundation of chalk, and there are miles of white cliffs towering above its beaches. The most famous are the White Cliffs of Dover. And Dover — with its bold bluffs and mighty castle — symbolizes the defense of Britain. Sitting atop those cliffs is the impressive Dover Castle. This site was England's primary defensive stronghold from ancient Roman until modern times. For many centuries, English troops were garrisoned within these walls — protecting the coast from any European menace. This Roman lighthouse is a reminder that 2,000 years ago the Romans landed here and established their colony of Britannia. The Roman fleet was based here in Dover harbor. To guide their boats safely home they burned wet wood by day — for maximum smoke — and dry wood by night — for maximum light. Long considered the "the key to England" by potential invaders, Dover Castle provides a quick review of England's defensive military history. Upon an earthen mound, originally part of an Iron Age fortress, is a many-layered complex with remnants from each age. In the 12th century, the Norman king, Henry II, had this fortress built making Dover's castle the most secure of his realm. With his troops at the ready and walls 20 feet thick, King Henry slept soundly on the top floor. Much later — around 1800, with the threat of Napoleon — Dover's fortifications were beefed up again. With the advent of artillery, the English dug defensive tunnels deep into the chalk. With the outbreak of World War II, more bombproof tunnels were dug. Today, visitors enjoy a fascinating tour. As if frozen in time, the rooms give an intimate look at how the British foiled the attempted Nazi invasion. They used an elaborate communications center to coordinate critical decisions with what was, at the time, state-of-the-art equipment. One command center coordinated the defense against German ships. As an island nation, control of the seas around Great Britain, for the free movement of both naval and merchant vessels, was critical. Another command center defended against the German air force. Attacking Nazi aircraft were charted on screens, and Battle of Britain defenses were plotted. From these tunnels, Winston Churchill and Allied commanders defended a battle zone nicknamed "Hellfire Corner." The underground hospital's operating room is a reminder that this strategic bluff was under constant fire. Emerging from the tunnels, visitors gaze toward France. Thankfully, more than 70 years after the war, this bluff oversees not bullets and bombs, but trade and tourism. While Dover was of great military importance, a half-hour drive away is Canterbury — long one of England's most important religious centers. For centuries, Canterbury welcomed crowds of pilgrims to its grand cathedral. While these days you'll see more tourists than pilgrims, the town is rich in history and architectural splendor. With thousands of university students and a thriving pedestrian zone, Canterbury has a lively and youthful energy. The town center is enclosed by old city walls and cut in two by its main drag. Patches of modern architecture are a reminder that much of Canterbury was bombed in World War II. For a leisurely, water-level view of Canterbury, take a calm cruise on the Stour River. Students, propelling their punts by the traditional single pole, offer an easygoing commentary. Rick: So this is the "Stour." Punting student: Great Stour River, yep. The "great" part's important 'cause there are about six River Stours in Britain. Rick: This is the "great" one? Punting student: This is the great one. The Anglo-Saxons weren't very imaginative when they named things. Rick: Well, and their other rivers are pretty small. Rick: The water's pretty clear. Punting student: It's crystal clear. It's 'cause it's a chalk river. Well, they say Kent is very famous for having chalky soil, with the White Cliffs of Dover, and chalk river's — the chalk filters the water. So you get this clear, clear water. On Butchery Lane, the surviving medieval buildings jut out with each floor — that was to maximize usable land as the population crowded within the town's protective walls. A square called "Buttermarket" — originally the dairy market — still functions as the center of the old town. The buildings here were originally designed to house and feed the pilgrims, whose money essentially built the city. For generations those pilgrims passed through this fancy gate to reach their destination, Canterbury Cathedral. 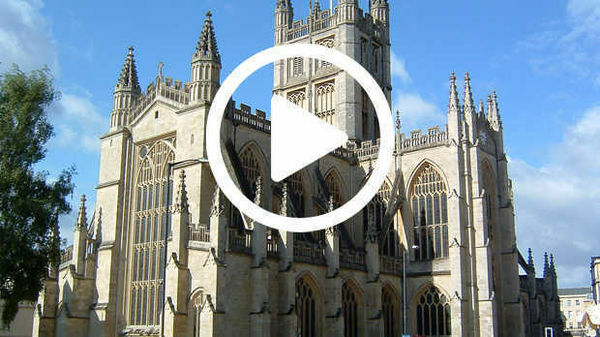 For centuries an important Roman Catholic church, the cathedral had a tumultuous path to eventually become the headquarters of the Church of England — known outside of England as the "Anglican" or "Episcopalian" Church. Stepping inside, you're swept away by the graceful blend of soaring Gothic lines, stirring windows, and fine stonework. The bell tower soars about 200 feet high. Gaze way up at the delicate fan vaulting at the highest point. The finely carved 15th-century quire screen is decorated with statues of six English kings. This wall, or "screen," separated the church into two distinct zones. One side was for the public. Then, stepping through, as if entering another world, you enter the private space of monks, where each day they'd gather to worship. The cathedral grew in importance, and wealth, after an infamous murder back in the 12th century put it on the pilgrimage trail. In an attempt to gain power over the Church, King Henry II appointed his friend Thomas Becket to be the new archbishop. But Becket unexpectedly took his new position and religion seriously — very seriously — and Henry was stuck with a strong church leader blocking his power. As tensions rose, King Henry complained bitterly about Becket. Finally, his knights took action, hacking the archbishop to death as he was worshipping…on this spot. The murder shocked the medieval world. Soon word spread that miracles were occurring here, the pope made Becket a saint, and masses of pilgrims came. With the steady stream of pilgrims, the church grew bigger and more important. Several centuries and several Henries later, Henry VIII broke away entirely from the Roman Catholic Church so he could run his affairs without popes and bishops meddling. Implementing his Reformation, Henry VIII purged the nave of its ornate decorations and Catholic iconography. He destroyed the relics of Becket, and pilgrims stopped coming. Henry made this cathedral the leading church of his now independent Church of England. And today Canterbury Cathedral, seat of the Archbishop of Canterbury, is the mother church of Anglicans worldwide. A scenic hour's drive takes us to the town of Battle — where, in 1066, the Normans, invading from France, conquered the English. The town, with its medieval abbey overlooking the main square, is named for the Battle of Hastings. For the English, a visit here is a kind of historic pilgrimage. The site is a mix of abbey architecture built on the actual battlefield. Just a vast field today, with the help of the audioguide commentary you can imagine Europe's epic medieval battle. Audioguide: Norman troops relentlessly hammer at what remains of the shield wall. There's fierce and bloody hand-to-hand fighting. William is in the thick of it, and loses another horse. But more and more holes in the English defenses open up. As the English position weakens, the Normans press home their advantage. Seven thousand soldiers died in one day — it was the most memorable date of the Middle Ages: October 14, 1066. Across the Channel in Normandy, the nine-century-old Bayeux Tapestry tells the complicated story. Basically, the English king died without a clear heir. An Anglo Saxon noble named Harold and a French-born duke of Normandy named William both claimed the throne. William and the Normans crossed the Channel. They fought furiously on the fields of Hastings. Harold was killed — according to legend, by an arrow in the eye — and William became "William the Conqueror." The Battle of Hastings was a big deal. From here, the Norman invaders swept into London, and William was crowned King of England and built the Tower of London to defend his realm. The Norman conquest of England established a strong centralized government and propelled what had been an isolated island of Britain into the European mainstream. Today, nearly a thousand years later, this successful invasion is seen as a good thing by the people of England. But enough war history. Let's hit the beach! Brighton is south England's Coney Island. Britain's royalty helped establish Brighton as a resort back around 1800, when Napoleon's wars shut down vacation travel on the Continent. King George IV chose Brighton to build a vacation palace for himself, and royal followers began a frenzy of construction along the nearby seashore. Soon, this once-sleepy seaside village was transformed into an elegant resort town. In 1840, the train connected London with Brighton. Suddenly these beaches were accessible to the working-class masses and Brighton has been "London by the Sea" ever since. Two landmarks line the promenade; the latest eye-catcher is a futuristic observation tower. But the big draw remains its pleasure pier. Built in 1899 and jutting far into the water, it gave everyone a chance to enjoy the sea. Glittering and loaded with amusements, Brighton Pier is the place to go for a fix of junk food, including some "candy floss" (that's cotton candy), and to survive dizzying rides. If you can ignore the garish arcade games, you might be able to imagine yourself as a Victorian Londoner out on holiday. Just a couple blocks from the people's pier was the king's palace. Brighton's Royal Pavilion, with its eccentric exterior, recalls the city's flamboyant heyday. Its interior, which retains its 1820s decor, is even more outlandish. As a prince, the man who would become England's King George IV was lively, decadent, and trendsetting. He loved to vacation by the sea and host glamorous parties. George was enamored with Asian cultures, styling his vacation home with exotic decorations from the Far East. Music was a passion of the king. In the music room the royal band gave concerts and serenaded high-society guests as they danced under Chinese-inspired decor. The king's other passion? Hosting elaborate dinners. His king-sized kitchen was one of the most innovative of its time. The huge rotisserie could cook enough meat to feed a hundred hungry guests. Here in the banqueting room, the table's set for dessert. Imagine England's pre-Victorian elite munching cream cakes and sipping liqueurs under the extravagant, dragon-powered chandelier. You can imagine: King George was an extravagant spender, and he left piles of debt. Shortly after his death, his niece, Victoria, took the throne. Queen Victoria wanted more privacy and less decadence, so she sold the Pavilion to the city of Brighton, which owns it to this day. After visiting a resort town, England's natural beauty provides a delightful contrast. These chalk cliffs are often mistaken for Dover's, but they're the white cliffs of Beachy Head — same chalk, same coastline, but further west. Beachy Head is carpeted by a vast, grassy field — wild, yet smooth as a putting green — reaching up to a dramatic drop-off. With the open sea beyond and white-chalk cliffs plummeting 500 feet into the surf, this scene thrills hikers. From here, a long, undulating series of cliffs stretches for miles. Long ago, these were dubbed the "Seven Sisters" by groggy sailors at sea who gazed lustily through the mist from their ships and imagined a can-can of seven maidens lifting their lacy petticoats. While this chalk may look like lace — from a distance, in the fog…in a drunken stupor — it's actually the shelly sediment of the seabed solidified over a hundred million years and then raised high by the slow-motion collision of continents. The handy hamlet of Birling Gap has an inviting visitors center. Its stairway provides the only convenient access to the beach. Early birds get the sandy spots among the pebbles, and the tide pools are a hit with the kids. Beachy Head is just one stretch of the South Downs Way — one of many beloved public walks that crisscross Britain. The English love to ramble and enjoy historic points along the way. Around here, as this mysterious horse illustrates, art has been carved into the underlying chalk of the hillsides for generations. Towering figures, like the Long Man of Wilmington, go back many centuries. The countryside feels made to order for easy walks. 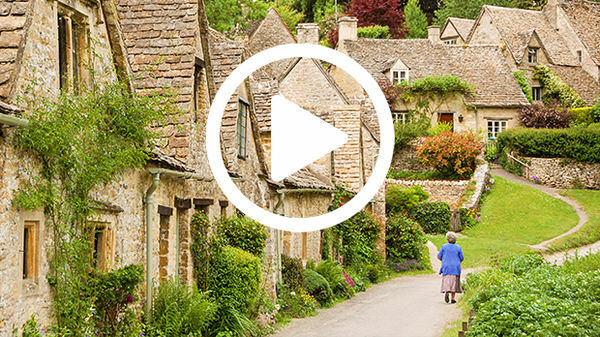 A delightful stop is the hamlet of East Dean — which still gathers around its medieval green. When hiking in England, it seems you're never far from a friendly pub [in this case, the Tiger Inn]. By the way, we're here in August. I like England in peak season — long days, best weather, and there're enough people out for things to be lively…but never really a crowd problem. A major city on England's south coast is the busy port of Portsmouth — long the home of the Royal Navy. For centuries, Britain, a maritime superpower, relied on the fleets based here to maintain and expand its vast empire. As an obvious military target, Portsmouth was nearly flattened by WWII bombs, but it's been rebuilt since 1945. Its cathedral survived only because the Nazis used it as a beacon to help guide their bombs. With postwar reconstruction hasty and poorly planned, the city became infamous for its bad architecture. But an impressive gentrification is under way. As the navy shrinks, and tourism grows, Portsmouth is enjoying new life. Underneath a sail-like tower, its formerly gritty industrial waterfront has been transformed into a vital shopping and restaurant complex. The once-formidable ramparts are now a park-like promenade lined with historic points of interest…mostly ignored by those simply enjoying a refreshing stroll. With the notoriously blustery weather, local kids gather at the base of the wall. Nicknamed the "Hot Walls," it's out of the wind and retains warmth from the unreliable English sun. At the tip of the ramparts, formerly salty old pubs now serve not sailors but a trendy crowd. Their conversation is punctuated by the passage of massive ships and ferries artfully powering through the narrow mouth of the harbor. Back when Britannia ruled the waves, it did so with its mighty navy, based here in Portsmouth's Historic Dockyard. This sprawling museum highlights England's storied maritime heritage — both very old and relatively new, like this gunboat from World War I that saw action at the Battle of Gallipoli. In a modern building just steps away is the oldest ship in the collection: the Mary Rose…or what's left of her. This awe-inspiring-in-its-day warship, King Henry VIII's favorite, sank in 1545 while fighting the French just off the coast. The ship and its doomed crew of 500 sank and settled into the mud, where it rested for about 450 years. The surviving bits of the ship, with a rich trove of artifacts, have been preserved and are beautifully displayed. All sorts of Tudor-era items were found: personal belongings, weaponry, a backgammon board, and even the skeleton of Hatch, the ship's dog. These artifacts humanize the everyday life of English sailors from five centuries ago. Three centuries later, another state-of-the-art war ship was the HMS Warrior. Built in 1860, it never saw a day of battle. That's because the Warrior was so formidable it was considered unbeatable. Its very existence was sufficient to keep the peace. The Warrior was the first ironclad warship, a huge technological advance. It had about a 10-year window of invincibility. But, after 1870, with the advent of guns on turrets and stronger steam engines replacing sails altogether, the Warrior was mothballed. About 200 years ago, the most important British ship ever, the HMS Victory, changed the course of world history. The French emperor Napoleon had been terrorizing the Continent. By 1805, he had amassed a huge fleet and was preparing to invade England. Admiral Horatio Nelson, who commanded the British fleet from this ship, cornered the French fleet at the Cape of Trafalgar, off the coast of Spain. The huge Battle of Trafalgar ensued. While Nelson was killed, the British emerged victorious. Today, the dry-docked Victory feels ready to haul anchor and set sail at any moment. For the British, this ship is more a shrine than a museum. The Victory bristles with cannon lining several gun decks. It took well-trained British sailors only two minutes to ready a cannon for firing, aim, and shoot, compared to eight minutes for the French. Inside, on the gun decks, you can imagine the noise, smoke, and confusion of battle — as cannons fired in unison, recoiled, and were reloaded. All the while, enemy fire crashed into and splintered the ship around the men. Climbing through the ship, with its low ceilings, you can feel how cramped the living conditions were. There was no such thing as privacy, and the tight quarters created a forest of hammocks. Often, sailors slept right where they fought. When not in battle, they ate at tables wedged between their guns. The Great Cabin was Admiral Nelson's quarters. Imagine Nelson and his officers hunched over charts to plan an attack. While it looks like an officer's living quarters, everything was designed for action. In minutes the furniture could be folded and stowed, turning this space into a fully functional cannon deck. During that fateful Battle of Trafalgar, Nelson was shot by a sniper. A golden plaque on the deck marks the spot where Nelson fell. The crew rushed him below deck to care for their leader in his dying hours. It's on this spot that Nelson died. Docent: So this spot here was — so when Lord Nelson was mortally wounded on the upper deck, he was taken down here; just before he was about to die, Captain Hardy come down and said to him, "Sir, we've won the battle." And he said, "Thank God, I've done my duty." Romantic paintings show the admiral lifted to heaven by angels, like a saint. Two centuries later, Nelson's England clearly enjoys its hard-won freedom. We've seen that with its love of nature, with its knack for family fun, its appreciation of heritage, and at its convivial pubs. I'm always impressed by how much there is to see and experience on this amazing island. I hope you've enjoyed our look at Southeast England. Thanks for joining us. I'm Rick Steves. Until next time…keep on travelin'.